Patellofemoral pain syndrome (PFPS) is the most common cause of knee pain in the outpatient setting. It is caused by imbalances in the forces controlling patellar tracking during knee flexion and extension, particularly with overloading of the joint. Risk factors include overuse, trauma, muscle dysfunction, tight lateral restraints, patellar hypermobility, and poor quadriceps flexibility. WHAT IS PATELLOFEMORAL PAIN SYNDROME ? WHAT CAN I DO TO PREVENT PATELLOFEMORAL PAIN SYNDROME? Typical symptoms include pain behind or around the patella that is increased with running and activities that involve knee flexion. Findings in patients with PFPS range from limited patellar mobility to a hypermobile patella. 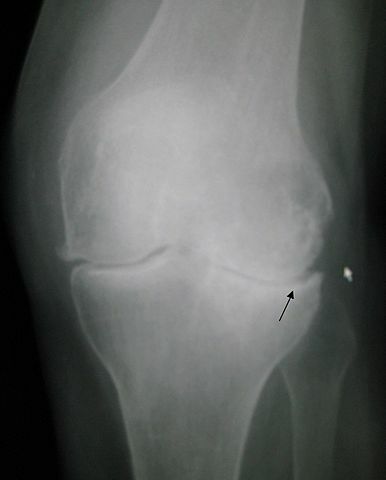 To confirm the diagnosis, an examination of the knee focusing on the patella and surrounding structures is essential. For many patients with the clinical diagnosis of PFPS, imaging studies are not necessary before beginning treatment. Radiography is recommended in patients with a history of trauma or surgery, those with an effusion, those older than 50 years (to rule out osteoarthritis), and those whose pain does not improve with treatment. Recent research has shown that physical therapy is effective in treating PFPS. There is little evidence to support the routine use of knee braces or nonsteroidal anti-inflammatory drugs. Surgery should be considered only after failure of a comprehensive rehabilitation pro-gram. Educating patients about modification of risk factors is impor-tant in preventing recurrence. Pain to the undersurface of the patella is variously called anterior knee pain, chondromalacia patellae, patella malalignment syndrome and patellofemoral pain syndrome (PFPS). Patellofemoral pain syndrome (PFPS) is pain that occurs between the patella (kneecap) and the femur (thigh bone). 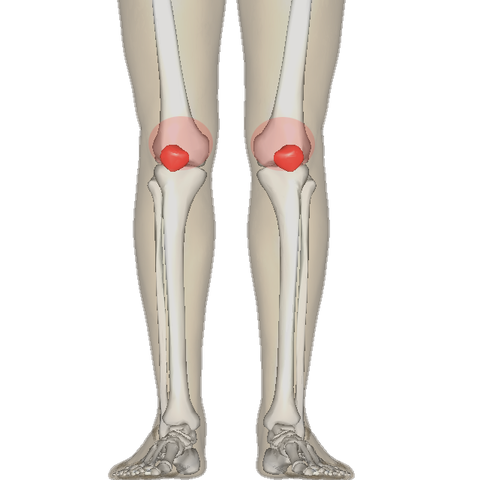 It occurs with overuse or when there is more pressure on the patella (kneecap) than your body can tolerate. 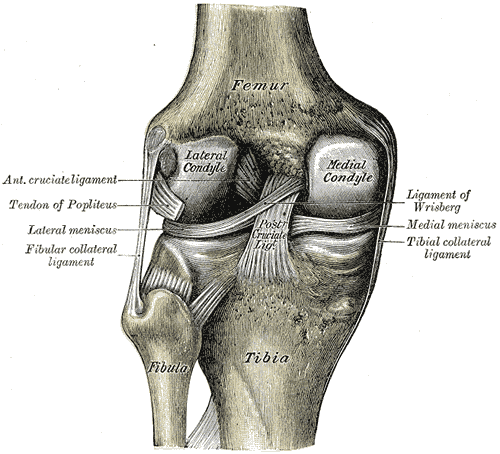 As the knee bends and straightens, the thigh muscles pull the patella into its groove on the femur. The articular cartilage covering the surfaces of the back of the patella and the groove of the femur can be rubbed and irritated to the point that the bone beneath it becomes very painful. The more compression from movement with resistance, the greater the pressure that develops at this joint. With this increase in pressure, there is an increase in friction at this joint. 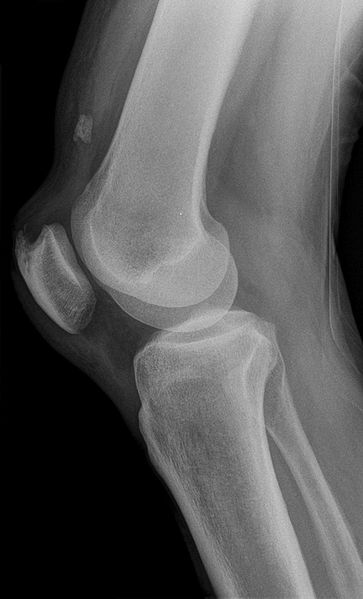 If cartilage degeneration does occur with this condition, it is to the ground substance and collagen at deep levels on the lateral edge of the patella. 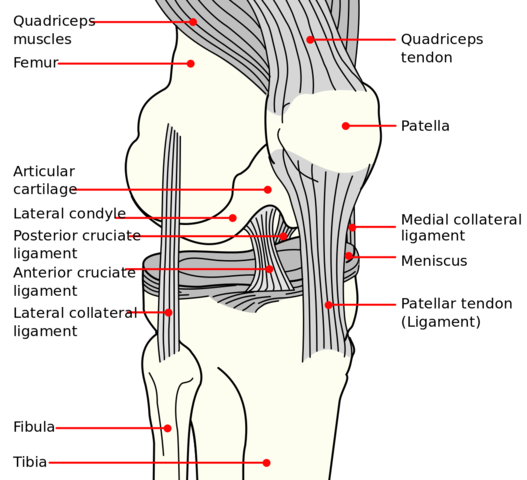 This results in a blistering of the cartilage as it separates from the underlying bone, but the cartilage surface itself is still smooth (Gruber, 1979). Pain under, around, or on sides of patella. Pain and stiffness under the patella after sitting for a while then getting up to walk. Grating, grinding, cracking, popping, “Rice Crispies” feeling under the patella with knee motion. Pain in the patella area with running, climbing stairs, deep knee bending, or kneeling. Feeling like the knee locks or catches. Overuse– too much, too often… long distance running, stair climbing, repetitive squatting, or kneeling. Type of Force– pounding or jumping activities, downhill running. Large Amounts of Force– exercise that requires the knee to bend against a large force or weight such as knee extension machine / leg extension machine at the gym, deep/full squats at the gym, direct blow to the knee or a fall on the knee. Muscle Imbalance– tight muscles (hamstring and calf) will cause decreased flexibility while walking/running forcing the patella to rub over a small area of the femoral groove leading to pain from excessive friction in a focal area. Weak or poorly toned muscles may not be able to adequately control the patella, allowing one area of the patella to be over used and get painful. Flat feet / Excessive foot pronation– this alters the joint mechanics and contributes to patellofemoral pain. Improper Footwear– running shoes that are not designed for long distance running (court shoes, cross trainer shoes) or running in shoes that are worn out. Running shoes need to be changed every 300-500 miles or 6-9 months. The first thing that should be done prior to returning to running after recovering from this type of knee problem is to get a new pair of running shoes. Appropriately warm up and stretch before exercise, practice, or competition. Allow time for adequate rest and recovery between exercise bouts, practices andcompetition. 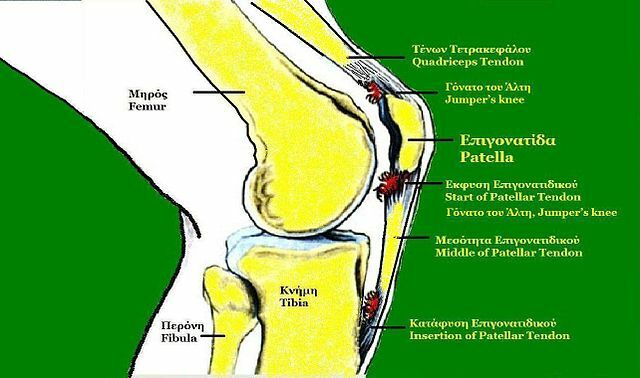 Acute patellofemoral pain will normally resolve in 6-8 weeks given sufficient rest from prolonged walking, running, jumping, and other aggravating activities. It will not improve by continuing to play, run, or work through the pain while continuing to run, jump, and perform the aggravating activities. Chronic patellofemoral pain (cases in which athletes continue to push through the pain with symptoms lasting longer than 6-8 weeks) can take 6 months or longer to heal. Anti-inflammatory medication can also help in resolving this condition. Rest– NO running, jumping, knee/leg extension machine, stair machine, or biking for exercise. Anti-inflammatory medication (aspirin, ibuprofen, etc) may be helpful in reducing both pain and inflammation. Stretching- Calf and hamstring stretching (hold each stretch 30 seconds, repeat 2-3 repetitions, 2 times per day). Strengthening- Quadriceps strengthening through isometric quadriceps setting 10-15 reps every hour throughout the day, straight leg raises 3 sets of 10 reps twice a day, PAIN FREE partial squats 45 degree knee bend going down quickly [in 1 second] and up slower [2 seconds], 3 sets of 10 reps once to twice a day. VMO strengthening as a treatment for PFPS is supported by biomechanicalstudies which show lower PFJ force withstronger VMO and clinical studies whichshow that it is an effective treatment. (Neptune et al 2000– Clinical Biomechanics). Strengthening of Gluteus Medius/Minimus- Weakness of these muscles will lead to an increase in femoral internal rotation and increased patellofemoral stress. Shoe Modification- Change to a new pair of running shoes if indicated. SLOWLY progress back into jogging by alternating between walking and jogging every other day with a gradual increase in jogging distance and decrease in walking distance until performing straight jogging. Shown to Reduce pain (Crossley etal 2002). Gruber, M.A., 1979. The conservative treatment of chondromalacia patellae. Orthopedic Clinics of North America 10 (1), 105–115. Neptune, R.R., Wright, I.C., Van Den Bogert, A.J. A method for numerical simulation of single limb ground contact events: application to heel–toe running. Computer Methods in Biomechanics and Biomedical Engineering. 2000;3:321–334.